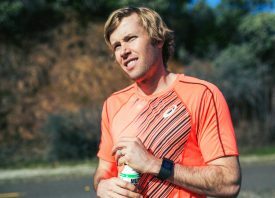 Ryan Hall, the American record holder in the half-marathon, is headed to Hawaii to run in the Paul Mitchell XTERRA Trail Run World Championship half-marathon at Kualoa Ranch on December 4. November 22, 2016 (Honolulu, HI) – Ryan Hall, the American record holder in the half-marathon, is headed to Hawaii to run in the Paul Mitchell XTERRA Trail Run World Championship half-marathon at Kualoa Ranch on December 4. While you might expect the 33-year-old, two-time Olympian to be considered the front-runner to win the upcoming trail championship, he begs to differ. Hall, who retired from professional running in January after struggling with fatigue in the final years of his illustrious running career, set out to combat the lethargy with weight training and dietary changes. Despite the muscle gain, one might still believe Hall could give reigning and three-time XTERRA Trail Run World Champion Patrick Smyth and reigning World Mountain Running Champ Joe Gray a good chase. When Hall was a sophomore in High School in Big Bear, California he came to Hawaii for the first-time to watch his dad race in the Ironman World Championship. “I was training in the dry and cool mountains of southern California so my first experience in heat and humidity training was in Hawaii. I felt like I suffered as much on my short 5-mile training runs as my Dad did during his Ironman,” said Hall. This time around, Hall will be discovering Hawaii in a whole new way. Hall, who heard about XTERRA Trail Run Worlds through his sponsors at Muscle Milk, said he was thrilled to get invited to come run in paradise and check out Kualoa Ranch. Hall says he’s also happy to be back running trails, which he trained on almost exclusively while growing up in the mountains of SoCal. Hall will watch his next movie on the airplane ride to Hawaii, and those lucky to be on Oahu over the XTERRA Weekend (Dec. 3-4) are invited to take in a free XTERRA University running clinic with Ryan Hall on Saturday, December 3, at the Waikiki Beach Walk at 10 a.m.
For more information visit www.xterrakualoa.com. When: Sunday, December 4, 2016 @ 9 a.m.
What: 9th annual XTERRA Trail Run World Championship half-marathon, plus 5km and 10km trail runs, an adventure walk, and free kids runs. Who: Roughly 2,000 runners from 20 countries and 40 U.S. States of all ages and skill levels from around the world. Registration: Sign-up in-person at the Waikiki Beach Walk from 9am-5pm on Sat, Dec. 3. Call toll-free to 877-XTERRA-1 (877-983-7721) with questions. The Paul Mitchell XTERRA Trail Run World Championship is sponsored by Outrigger Resorts, PowerBar, Gatorade Endurance, Muscle Milk, the Hawaii Tourism Authority, Kualoa Ranch, XTERRA TV on Amazon Video, Trail Runner Magazine, Compex, XTERRA Fitness, Optic Nerve Sunglasses, XTERRA Boards, XTERRA Travel, Greenlayer, and Surgicare of Hawaii.